Industry leaders from Google Analytics Authorized Consultants EpikOne and WebShare, AdWords Seminar Leader Anastasia Holdren, Analytics Evangelist Avinash Kaushik and others will cover in-depth training on Google's online marketing suite and dive into strategic insights at the thought leadership day. Daily workshops will cover all aspects of Google AdWords, Google Analytics and Website Optimizer along with special sessions on social marketing, mobile strategies and more. Plus each night you'll experience the best Vermont has to offer while socializing with peers, including brewery tours, lake cruises, shopping, sightseeing and more. Did we mention brewery tours? Burlington was voted one of the best small cities in which to do business by "Inc. Magazine" and offers tons of outdoor activities for families. It'll be fun, but don't get us wrong - you will come away from this Summit with increased expertise and contacts that will do nothing but benefit you and your business. Learn more and register online at www.epikone.com/summit. Ah, Burlington, Vermont in late summer....can you do any better? The summer is winding down and the last quarter of the year is still a ways away and easily prepared for. All of France is on vacation. :-) The weather is just right on Lake Champlain. There's some time to get energized for the holiday season. It's a good chance to take a break, roll up your sleeves, learn some new skills and do some networking. And if online marketing and analysis is your field, there's no better time and place than Burlington this August to do it. Once you've defined the segment, make it active and you'll be able to make side-by-side comparisons of All Visits versus Visits with Events throughout your reports. The variety of event related segments that you can create is only limited by the event details you track. So, if you track video interactions, you can create segments that only include visits during which videos were viewed. For a 2-minute walkthrough of how to set up event related segments, check out this video. To learn more about how to set up event tracking on your site, read the Google Analytics Event Tracking Guide on Google Code. Once I click Apply, I'll see the graph below. The problem, though, is that this graph is not very useful to me as a comparison tool because the days of the week don't line up. The first day of the current period (March 16) is a Monday, so I'll use the date slider to move the first day of the previous period back to Feb 9, also a Monday. Just click the Timeline tab to see the date slider and drag the previous period (in green) to the left, one day at a time. The date will change in the text box as you drag the slider. Then, click Apply. Once I've lined up my days, I can compare weekdays to weekdays, and weekends to weekends. For example, I can see that, except for the first Wednesday, I received more traffic on all of the Wednesdays in the previous period. Next time you use Compare to Past, try using the date slider to adjust your previous time period. It's possible that you'll uncover new insights about your day to day traffic. You probably already know that you can quickly compare two date ranges against each other simply by clicking Compare to Past. So, in the screenshot below, clicking Compare to Past will allow me to compare the current period (Mar 16 - Apr 15) with the previous period (May 16 - May 15). which allows you to subscribe to and follow any blog or website, and then read them all in one place via a table of contents on the left. It's my first stop when I open my browser in the morning, and probably where I spend the most time online. You are your own publishing house and your own news aggregator. There's also some other handy features, such as a task and notes list, as well as a way to browse other users' subscriptions, share certain content with different groups, see a trends graph on what you've been reading the most, and more. But what we wanted to share is the translate feature. We recently posted about Google Analytics and conversion-related blogs in other languages, including Spanish, German, French, Japanese and even one focused on the UK market. A colleague brought the following to our attention: with Google Reader, you can read all of these blogs by using a translate feature to read them in your own language with the click of a button. So, if you're reading these words right now, and your first language is not English, go into Google Reader and subscribe to this blog and then translate. Here's how you do it: 1. Click and read a subscription. 2. Click the "Feed Settings" drop down. 3. Choose "Translate into my language." Cool, huh? Hope this was helpful for all you avid readers out there who can't get enough of analytics in just one language. Every now and then we like to give a shout out to another Google product and today, as avid bloggers, we wanted to mention Google Reader which allows you to subscribe to and follow any blog or website, and then read them all in one place via a table of contents on the left. It's my first stop when I open my browser in the morning, and probably where I spend the most time online. You are your own publishing house and your own news aggregator. There's also some other handy features, such as a task and notes list, as well as a way to browse other users' subscriptions, share certain content with different groups, see a trends graph on what you've been reading the most, and more. What works better, a centralized web analytics team with deep technical knowledge, or non-expert users spread throughout an organization? This was the question faced by Amy Sample when she joined PBS Interactive as web analytics director in the fall of 2007. Amy shared her story with us in response to our call to share your web analytics story. PBS Interactive helps individual PBS producers and local PBS stations create and promote microsites for programming like NOVA, American Masters, and Sid the Science Kid. Amy had the difficult task of helping these managers make educated decisions about how to improve their online show sites. When Sample came on board, she learned that PBS had standardized on a single analytics tool. This was a good first step, but few at the company were familiar with the tool and the reports it generated were not being used to take action. Producers wanted to know more about how people interacted with microsites for their programs, but they weren't sure what to focus on. At the same time, the analytics group had a hard time keeping up with demands from so many stakeholders. According to Sample "The producers wanted to dig deeper into their site data than a monthly report could provide." Amy's response was two-fold. First, after consulting with a pilot group of producers and other members of the interactive group, she decided to deploy an installation of Google Analytics. In Sample's words "We chose Google Analytics because we had to deal with a diverse group of needs and very limited resources. We wanted a system where a user with very little training could get insights right away." Second, Sample worked with LunaMetrics, a Google Analytics Authorized Consultant, to manage the complex issues PBS faced with cross-domain tracking and a complicated account structure. LunaMetrics also created training materials, hosted an on-site training for PBS staff, and conducted a series of training webinars for producers and local stations. As it turns out, despite challenges around getting resources assigned to tag pages and working out the right account structure, deploying Analytics was actually the easy part. In Sample's experience, the more challenging problem came in spreading knowledge and awareness of Analytics through the organization in a way that lets people take action on the data. "My approach has been to teach people how to fish," Sample explains, "It's been about doing training classes and one-on-one work with key practitioners, creating specific training decks by job function and getting other groups to use Analytics data in their daily activities." Site Search Tracking - The PBSKIDS.org site has implemented changes as a result of insights gleaned from site search tracking that have increased traffic to the site 30% in the last year. Funnel Optimization - The PBSKIDS Island team used funnels to optimize their registration path resulting in a 3x improvement in conversion rate. Content Optimization - An analysis of users’ video consumption behavior on PBS.org and PBSKIDS.org led to the development of the PBS Video and PBSKIDS GO! Broadband portals. PBS went even further, basing a full 2008 PBS.org redesign on the data that indicated which content visitors access. Advertising Optimization - PBS' marketing group also looks at post-click behavior for their display ad campaigns to zero-in on referring sites that send high-quality traffic. They use this information to optimize successive campaigns. Sample's long term vision is to extend Analytics to measure engagement with PBS content both on-site and off-site. She also hopes to gauge the impact of online content on TV tune-in and track online donations, while expanding her training efforts to teach producer colleagues how to segment traffic and drill deeper into visitor behavior on their microsites. The lesson learned is that no matter what analytics tool you're using, a well-planned deployment is only a first step. The hard part is "teaching people to fish," and making analytics data a key component in your organization's everyday business decisions. and our developer documentation. Here are some highlights. If you are pulling large amounts of historical data, we've increased the the total amount of data you can request from the API from 1,000 rows to a new the new maximum of 10,000 rows. This is a great feature to reduce the amount of work needed to pull large amounts of data from the API. For page, what keywords had the highest bounce rate (ga:bounces/ga:entrances)? For a group of pages, what large companies (ga:NetworkLocation) were viewing my content and how enagaged (ga:TimeOnPage) was one company vs. another? Finally, for each profile listed in the Account Feed, we've added the profile's configured timezone and currency settings. Here is an example in XML of the updated account feed. Of note is that all of the above updates were prioritized based on feedback we received from developers. Thanks! If you have any comments or requests specific to the Google Analytics Data Export API, please let us know through our Data Export API User Group. Also, you can stay up to date with the details of these updates by joining our analytics-api-notify group. Recently, we released important updates to the Google Analytics Data Export API and our developer documentation. Here are some highlights. Avinash, our Analytics Evangelist, and Nick, our Developer Relations Manager, both come from a long history of working with web analytics and both enjoy a good debate. In fact, I often hear them bickering in a good-natured way - or not good-natured at all with much name calling - about the topic of this episode: what do you disagree about in terms of each other's approach to web analytics? 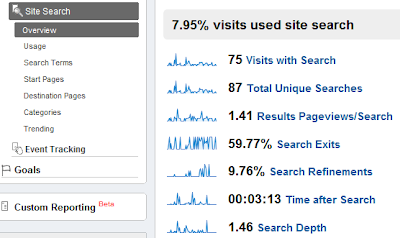 Web analytics is a highly collaborative practice, more of which we'll cover in future episodes of DDD, and with just a little work, it can be a fascinatingly useful moving target. It's a struggle to balance what can be done with what data is valuable, and as a discipline it should always be approached with a spirit of pragmatism, which both our practitioners touch on in this video while clearly having fun. It's a lively topic where we learn what's important to Avinash and Nick. Hopefully it also shows that no matter the approach, the most important thing is that the dialogue is actually happening and analysis is getting started. And near the end, you'll hear about one issue they both agree is a big challenge in terms of measurement, and what they think about it's usefulness. There are more of these videos to come where you can enjoy more fireworks between Avinash and Nick and be inspired. And, please continue to contribute questions for future episodes to google.com/analytics/ddd. We'll get to them over the next few months. 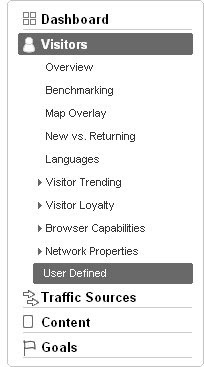 Have you ever been in the Visitors section of your favorite Google Analytics profile and wondered what the heck “User-Defined” was? Well today it's time to find out. The user defined variable allows you to "label" a visitor if they complete a certain action on your site, such as making a purchase or visiting a key page. These labels are useful because they last across multiple visits to your site. These labels are often called Custom Segments (or Custom Segmentation). You can see the data from these Custom Segments in the User Defined report, which is the last report of the Visitors section in Google Analytics. How do I add these “labels” to my website visitors? Making use of the User-Defined report in Google Analytics requires a bit of extra coding help from your IT department or webmaster, but it’s often well worth the effort. Notice the line in bold that includes _setVar. When this is present on a page within the Google Analytics Tracking Code, an additional cookie (called the __utmv cookie) gets set on a visitor’s computer, with its sole purpose being to identify the visitor by the label (or value) that you used in the code. If you take a look at the code example above, you will see that I used the term “customers,“ the label that I want to appear in the User Defined report. Now, on their next visit to the site, they will be identified as a part of the “customers” segment in the User Defined report, allowing you to perform analysis on all visitors who have purchased something from your online store. Neat, huh? Can I use _setVar when someone clicks on a link instead of visiting a page? What will this look like in the end? After the data has been collected by Google Analytics, you can interact with it just like you would with any other report. Click on the “Goal Conversion” tab directly above the table to see how many customers have reached key pages of your site, or use the dimensioning feature to see what sources of traffic were responsible for bringing these special visitors to your website! Are there any other ways to use _setVar? One neat usage of the _setVar function is to use it to exclude your own traffic from reports when using a dynamic IP address. For example, let’s say that you wanted to exclude your entire company’s traffic from appearing in reports, and your company uses dynamic IP addresses. Because it would be nearly impossible to write a filter to exclude traffic from a dynamic IP address, you can create an HTML page that is not a part of your website and add Google Analytics Tracking Code with the call to _setVar and a label of “employees” (or something similar). As we just talked about, when a person visits a page calling the _setVar function, the __utmv cookie is set on their computer. This is a persistent, first-party cookie that has a lifetime of two years. This means that every time a user with a __utmv cookie returns to your site, the label assigned to the user will continue to identify them as such until they either delete the cookie or visit another page with another call to _setVar with a different label. The purpose behind something like a User-Defined report - and Custom Segmentation in general - is that it is not designed to be updated very often. This label, for the most part, should be a permanent one for a visitor. You should only use _setVar on pages like a receipt page of a shopping cart, or an account registration “success” page for a visitor who becomes a member of your site. You shouldn’t use _setVar on your homepage, or use several different _setVar’s with different labels scattered across many pages of your website. Google Analytics - at this time - only has the capacity to store one custom segment at any one time for one website. So if you are using multiple calls to _setVar on your site, Google Analytics can only store the latest value that a visitor runs into in the __utmv cookie. John Henson at LunaMetrics – a fellow Google Analytics Authorized Consultant - has created a custom version of the Google Analytics Tracking Code that can support multiple custom segment labels at any one time. On the other hand, Google Analytics uses what they call the “first association” of the session for visitor session calculations. If you are using multiple calls to _setVar on your site, be aware that if a user runs into the first one, and then runs into the second one in the same visit, their Goal Conversion and Pages per Visit metrics would be attributed to the label of the first encounter with _setVar. For page view calculations, Google Analytics uses the most recently defined value. So if a person runs into the second instance of _setVar on your site, all of their pageviews afterwards - including the current pageview - will be attributed to the second _setVar’s label, even though as we just learned in #4 above, visitor session information is attributed to the first encounter of _setVar. A full, technical explanation of _setVar and the User-Defined Report can be found here. 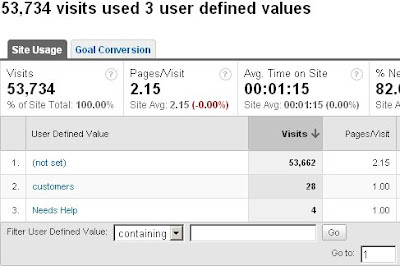 The User Defined report in Google Analytics is a great place to start segmenting your traffic. With a little bit of help from your IT department, you can not only begin to collect awesome data, but you can also begin to gain advanced knowledge about what makes your VIP website visitors register, sign-up for your newsletter, or purchase something from your online store. This will definitely help you become that Analysis Ninja that Avinash Kaushik loves to talk about! Written by Joe Teixeira of MoreVisibility, a Google Analytics Authorized Consultant.
. But, before your website can close a sale, it has to get the visitor's attention. Presenting your visitor with a landing page that's relevant to what she's looking for is the best way to start the conversation and proceed towards the conversion or sale. Of course, you'll want to pair your landing pages with the appropriate keywords and ads. But, what else can you do to get more visitors to become customers? Google Website Optimizer can help you identify the copy, images, and page layout combination that is most effective at getting visitors to convert. The key is to use Google Analytics to find out which landing pages are least effective, so you can start working on those first. Our first Google Analytics + Website Optimizer in 60 Seconds video shows you how. Do you have a tip on using Google Analytics and Website Optimizer together? Feel free to post a comment and share. And, be sure to check out the techie guide for more advanced Website Optimizer tips. A couple of months ago, we published a post on making your site a closer. But, before your website can close a sale, it has to get the visitor's attention. Presenting your visitor with a landing page that's relevant to what she's looking for is the best way to start the conversation and proceed towards the conversion or sale. Of course, you'll want to pair your landing pages with the appropriate keywords and ads. But, what else can you do to get more visitors to become customers?